Arachnophobia is defined as the "extreme or irrational fear of spiders." But that "fear" isn't just limited to Earth. 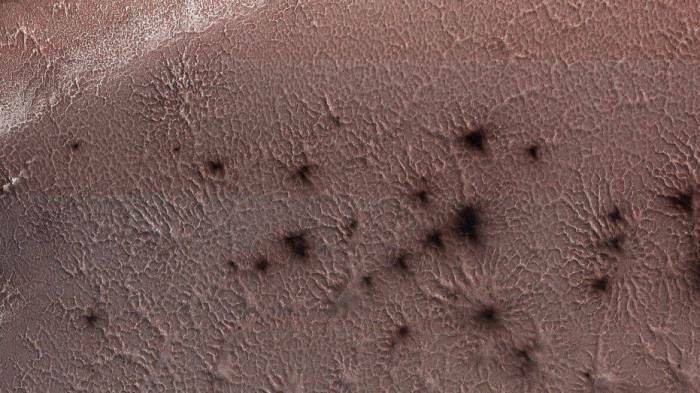 NASA shared a creepy image of Mars on Thursday, showing "'spiders' begin to emerge from the landscape" from the South Pole of Mars. The spiders are not actually eight-legged arachnids, though. In fact, the "spiders" seen in the image are actually "araneiform terrain," which NASA describes as "spider-like radiating mounds that form when carbon dioxide ice below the surface heats up and releases." The government space agency noted that the process is not found here on Earth and is caused when carbon dioxide ice turns from a solid into a gas. The gas then builds up under the surface and ultimately breaks through in jets that deposit a darker dust around the planet. "The loss of the sublimated carbon dioxide leaves behind these spider-like features etched into the surface," NASA explained on its website. The image was taken by the Mars Reconnaissance Orbiter on May 13, 2018, during Mars' winter season.